The Inova outdoor lantern, a modern take on the traditional outdoor lantern, constructed from stainless steel and fitted with an intergral motion sensor. Keyhole shaped wall mount, with integral PIR sensor and two lantern support rods supporting a domed tapered stainless steel lantern, fitted with a vandal resistant polycarbonate panel. 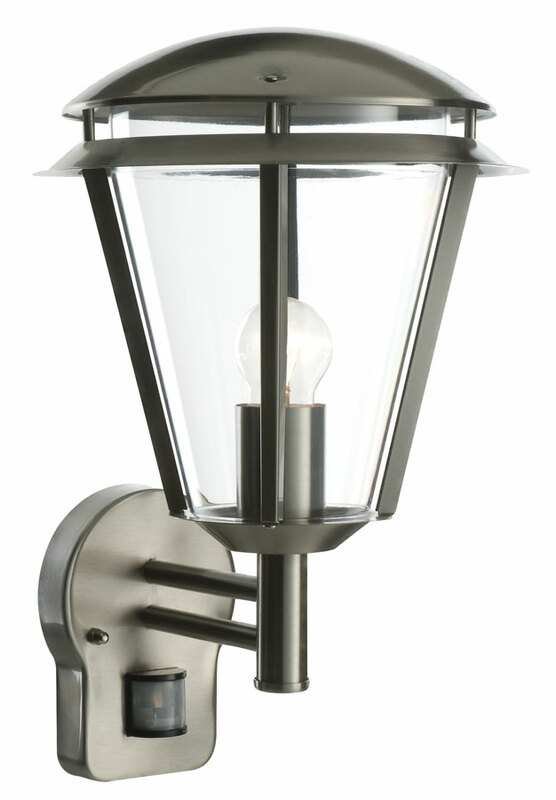 Other products in the stainless steel Inova outdoor lighting range can be viewed below and include a non-PIR version of this wall light and a matching 80cm tall bollard light. The range is also available in a matt black finish. is the PIR on the Inova modern Outdoor M/S wall lantern stainless steel Product code 49945 adjustable up and down? It will be mounted at 2m. above ground level but I need the PIR to pick me up at the top of a flight of 6 steps about 6m away from the light. so if the PIR is adjustable upwards then it will better at picking me up at the top of the steps. Dave. Hello David, the Inova PIR light should be installed at 1.8m above ground level. There is a PIR range adjustment screw used to set the detection range from 1m to 8m when installed at the recommended height. This information is in the installation instructions linked from the product description for you to view or download. Please can you tell me if this wall light can be switched on and left on all night if we wish. And then if other times we just want to set it so the PIR activates. Can this light work with LEd bulbs, and also is the bulb replaceable. As I am not interested in an outdoor light where the bulb can not be replaced. This light has an E27 lampholder, and as such can be replaced with any suitable light bulb, including LED types. Can I just confirm that this is a ‘hi/low” light? That at dusk this comes on at a low light and then brightens when it senses motion? And then goes off at dawn? Thanks! This PIR sensor light does not offer the dual light level feature, it is simply an on/off light, which is triggered when is senses movement during the hours of darkness.